A salon or a spa requires essentials like robes, capes, towels, aprons, jackets, and more. A certain kind of uniformity is always appreciated in any workspace. When it comes to a creative spot like salon, then apparel and accessories enhancing comfort and relaxation are always appreciated. To help you all with such apparels, Salonwear is here to provide you with its best long tunic top which shall keep your employees comfortable and stylish. 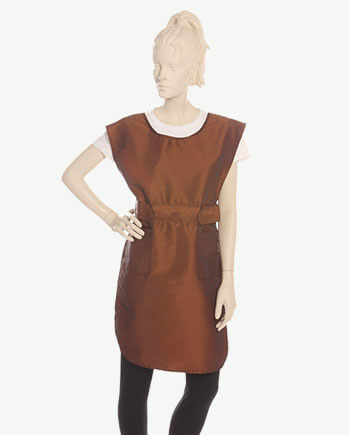 These tunic top outfits would protect the clothes from any kind of unwanted spills and stains. What are we offering in Beauty Tunics for Salon? These long tunic tops are best suited for people who tend to use a lot of colors or do haircuts, as their outfits are saved from getting damaged. The long black tunic tops are great for rugged use and are also stain resistant. Apart from our tunic tops, we also have other types of vests such as the sleeveless vests, sleeveless coats and sleeveless vests with rhinestone zipper. Salonwear offers you with top quality tunic tops for Hairdressers, salon stylist & spa specialist made of silkara iridescent fabric. The colors available to the buyers include black, white, brown, navy blue, burgundy, and bronze. Out of these the long black tunic top, burgundy tunic top, bronze tunic top, navy blue tunic top and brown tunic top best suit those who get a little clumsy while working and tend to spill things more. The dark colors ensure that spillage doesn’t show. Long white tunic tops are also available at Salonwear. Black and white tunic tops look classy, whereas women’s navy blue tunic tops look vibrant and fun! 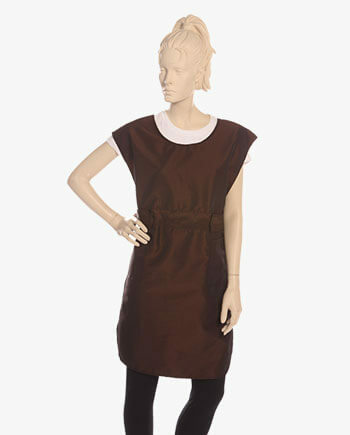 These tunics are available in four sizes, including small, medium, large, and extra-large. All of these are proven to be of great fit and quality, as can be confirmed by our former customers. Additionally, for extra comfort, the designers have made sure to add two hairless front pockets and a waist enhancing belt. These tunic top dresses have over the shoulder designs with two adjustable side straps and are sleeveless. One great specialty of shopping at salonwear is that you get an option to customize your orders with your salon or spa’s logos. To provide our customers with a feeling of ownership, we offer two types of logo customizations: printed and embroidered. Our logo embroidered tunic tops not only look great but also help in creating your brand identity. Why choose Salonwear’s Hairdresser Tunic Tops? We have enjoyed undisputed trust by our customers in our 31 years of service as a family business. Salonwear prides itself in serving the world with top quality products and homely shopping experience. We feel greatly honored that most of our clients are satisfied repeat buyers because of our progressive vision and approach. Salonwear aims to be the number one salon apparels and accessories manufacturer in the USA. Have a glimpse of our trade shows.